For the majority of us pronouns are simple. He or she, these words are assigned at birth and mean something about who we are, who we will be, who we’d like to become. Of course as feminists and many others will tell you, it’s not nearly that simple or that well defined. For transgender and gender neutral individuals the choice of pronoun is infinitely more complicated. Choosing “they, “he,” or” “ze” says something important about identity and aspirations. For friends and family, learning and using the preferred pronoun is a big step in affirming transgender teens or adults. Beyond Magenta explores the journey of six transgender teens as they discover their own gender identity, reveal it to others, and decide, with their parents or without, who they are and who they will become. Kuklin’s photographic portraits accompany all but one of her interviews, including shots chronicling transformations through hormones. The stories are touching, heartbreaking, and thought provoking. These are not well reasoned adult narratives, but the teens are surprisingly articulate because they have been exploring their gender identity through therapy for some time. I found the book a quick read because I was so engaged with each and every one of the stories. The pictures gave me a sense of each teen’s journey and ideal self and allowed me to slow down and reflect on the words I had read as I looked at the pictures. In interviewing six teens and not more Kuklin has presented a small portion of the types of stories and gender identities out there, but is a great starting point for reading about transgender individuals and issues. 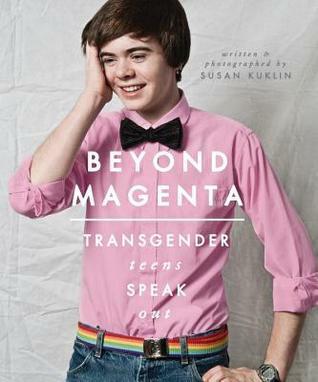 Beyond Magenta struck me as a great resource for teens who are questioning, transgender teens who need to read the stories of others, and both teens and adults with little experience with transgender issues. Teens and adults alike should be able to access this book in libraries, classrooms, and liberal houses of worship. Six teens and Kuklin have made the struggles, wishes, and joys of transgender teens clear to cisgender (someone who’s self-identity matches their biological gender) folks. They’ve also bravely stepped out to provide a resource for other transgender or questioning individuals, whether teen or adult, helping them understand some of what it means to be transgender. Thanks for sharing, Sarah. I’ll certainly be picking up a copy of this book.